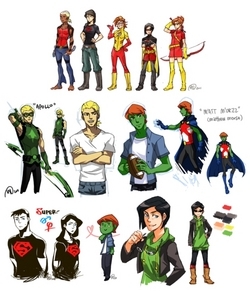 Young Justice Who wants to be in OC gender bent fanfic? Basically the title. I’m gonna gender bend all the OCs and see where my little story goes. I just need info. Quick Summary of Past: Killed her mom and her four friends after losing control of her powers in a public park when she was six. Lived with Robin and Batman for two years after the accident with her mother. Was seperated from her younger brother at the age of three. Weapons: kind of like Robin's utility belt.. and she controls fire. and flies. and stuff. Connection to team: She's a member. And her bro is robin. Fun Facts: she hides her iPod in a secret pouch on her belt for missions cuz she loves it so much, her bangs are always on the left side of her face, wears a gold locket with pics of her mom and dad, likes to watch random youtube videos in her spare time, has more than three personal enemies. Quick Summary: after her parents died in a circus accident, she was separated from her brother and went to work with Slade for four years. Now she can't stand the thought of leaving the team, because the only place she can go is back to him. Personality: she's like a mini batman, kinda Catwoman,(sometimes), care,mean, fun, and sometimes happy. Relationships: Batman's biological daughter, Robin's sister. Fun Fact: she hides a dog's cookie if needed because of Wolf. Summary: Batman leaved her when just born then taked her again at 8 years, she watched her mom's death and lived It first hand. She wants revenge against Joker for killing her mom. Name: Charmante Roi or just Charm. Eye Color: Dark brown that flickers crystal blue at any given moments. Weapon(s): Has a Smith & Wesson semi-automatic Pistol thats much heavier compared to his own handmade Glock thats used for rapidly fire while his pistol is for accuracy shots. On his forearms and throat he has a black band that when taken off it acts like C4 (explosive). Carries two blades, a swiss army knife hidden in his right combat boot and broken katanna that he sharpen to make a point. Charm keeps it in an 2-inch longer shealth that hangs sideways on his lower back, often uses this sword with his swiss knife as duel-blades. With the strength equalling Superboy, he knoes basic forms of most fighting styles however he specializes in Submissions, Brazilian jiujitsu and Muy Thai Kick-Boxing as well as Parkour/Freerunning. Personality: A Byronic Hero (just wikipedia it), Sarcastic, cut-throat, pharp-tongued, witty, he is the king of divas showering everyone in his sass, philosophical and very, very, protecting and self-sacrificing of his family. Relationship: With Amara or her alias Tundra. Connection to Team: Neither foe or ally. He will not hesitant to use and/or toy with them nor help them out, it all depends on the situation and what would benefit him the most. -Charm is a major player in the Cartel. Often is target of Black Mask or other major Drug Dealers/Transporters. -Deathly afriad of cows and also have a love for pancakes. -Has an adoptive 6 yr old daugther name Bonnie, who he truly and deeply love. -Either shown wearing his gas mask with the right lens punched out (left lens is cracked) or purple aviators sunglasses. -Show signs of PTSD and Sociopathics. Summary: He is a soldier who fought in the Revolution War in his country, however beforehand when he was just 7 he went undergone vigorous training that did more harm then good. Causin him to have a crack in his mental stability. However, he claims to say it does not bother him when really does. He merely put up the front to comfort his Daugther and Girlfriend. Revenge, Nightbird, Vendicta, Phoenix, and Silver Bullet are ALL out. Sorry, I don't play well with this stuff. Personality: Smart Alec, doesnt show much emotion. Weapons: Escrim sticks but has more hidden on her. Personality: She can seem shifty and mysterious. keeps to herself. Protective of those she loves and fights to the death. Fun Facts: Becca has a craving for chocolate. She will KILL for it. When on sugar, she goes nuts!!! Acts like she's high. She loves her sister Willow and is constantly invading Wally's room for random things she "needs." Hates Thunder. Quick Summary of Past: was born a princess, taken to human world and was adopted. Grew up with robin in the circus. parents were murdered and her sister is currently trying to kill her. Hello, I am so sorry! Normally I'll never ever cut someone from a fanfic, but this story is not in the season 2 timeline. So it would be breaking the story to have Tim in the fanfic. I am so sorry, please forgive me. Weapon(s): She uses guns of al sorts! Manly a shotgun and pistol, but is an ace with snipers, rifles, machine guns, ect. Also uses two swords, a dagger, and keeps a combat knife hidden on her thigh. Se also can control lightning by snaping her fingers to create it, she can shoot it anywhere.... Also she can teleport ad read/control minds... If she focus' her mind hard enough she find a person's location. Personality: She's always up for a challenge, very hard headed, and kinda a flirt, doesn't show emotions much. Blade also loves killing and beating people up! She can be sweet but sometimes fails... LOVES TEASING PEOPLE! She always ttrys to be "The Hero" and gets ticked off REALLY easily! AND is a huge smart alic! FuN fAcTs: She hates her past and her dad, she loves putting her hair up but will wear it down, likes to spar, ect. Bleh... Oh has a black cat named Kitty.. Has no fear! Big daredevil! Past; She saw her sister die right in front of her when she was 6. Sheleft be was found by her dad, she was punished by having him carve a "B" in her back with a knife... (she still has the scar) Her mom was murdered by her dad. She was trained to fight or die and never give up or run..
Name: Phoebe Katia Shannelle Alice Rouge! other:mums from the UK so has a british accent. Personality: Evil, dark, smirks at hero jokes, loves to witness other peoples pain. Quick Summary of Past: She has been hunted from age 11, she has learned to trust no one because her father atacked her, now is a villian waiting to strike. 1. A very strong vivid photographic memory. 2. Can intemperate sounds really well. 14. Very advanced at Science. Personality: Immature, mysterious, hard temper, caring, trustworthy, likes to think she's in command. Fun Facts: She loves calling out jokes at any random time. She loves designing and arts. She loves hunting and tracking. She is a fastfood/sugar addict-she craves for it. She also likes doing pranks at any unsuspected moment. Quick Summary of Past: She started her hero career at the age of 11 being a regular crime fighter and was a spy and agent at the age of 12 for a year. She found out about this team (when she just turned 13) when she came for a visit in Gotham City. Personality: Bold, strong and also a bit shifty sometimes. Quick Summary of Past: Her past is unknown. Some people say she just woke up from a crash landed space-ship and runned wild.